The inventor of Nautilus treadmills, Arthur Jones, started the company in 1970. By the time they expanded and launched the signature Bowflex line in 1986, the focus was on strength training machines and the company became the first manufacturer to design circuit equipment. Eventually Nautilus branched out into cardio equipment including exercise bikes, elliptical trainers, and treadmills. Nautilus, Inc. (NYSE: NLS) has acquired several brand names over the past 20 years including Bowflex®, CoreBody Reformer™, Universal®, Stairmaster®, Schwinn® and most recently, Octane Fitness. In 2010, Nautilus sold the licensing assets for Stairmaster and Schwinn’s indoor cycling commercial products to Fit Dragon, Inc. but kept the Schwinn home cardio products. Nautilus and sister company Schwinn share their treadmill designs. Currently, both brands offer three treadmills each which are identical except for the color of the cosmetics on the console. The Nautilus T614 (which is also the Schwinn 840) offers a 2.75 HP continuous duty motor, a 20" x 55" walking area, a 12% incline, a soft-drop folding frame and 22 built in workout programs. The Nautilus T616 (which is the Schwinn 870) has a 20" x 60" deck, 3.0 HP motor, 15% incline, and 4 more programs than the T614. It also has Bluetooth tracking capability via the Nautilus Trainer and Run Social Apps, a free wireless chest strap included with your purchase. The newest model, the Nautilus T618 has the strongest motor, a 3.5 CHP, plus handrail speed and incline controls, light commercial running deck, more advanced Rebound cushioning and a higher max weight capacity than the T614 and T616, at 350 lbs. as opposed to 300 lbs. While reviews find that these are decent treadmills, they all have weak warranties, and the T614 is fitted with the least attractive console of any treadmill made. If the poorly designed console doesn’t turn you off, the tiny LCD windows provided for feedback definitely will. Which Nautilus Treadmill Should You Buy? For more basic use, walking and light jogging by 1 or 2 individuals of average size and weight, the Nautilus T614 should be perfectly fine. For anything else, you should definitely consider one of the more advanced models, especially since there is not much difference in price between the three Nautilus treadmills. You get more of everything stepping up to the T616: more incline, longer deck, stronger motor, more workouts, tracking capability. That's alot of extras for another $200 max. 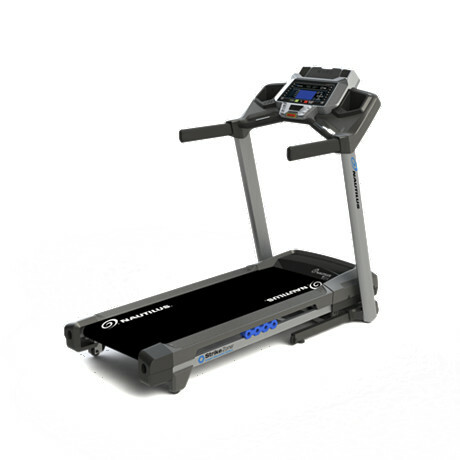 For heavier use, or if there will be a lot of you pounding away on the machine, you may need the extra durability of the top of the line T618 treadmill. It bumps up the max weight capacity to 350 lbs. and gives you much better cushioning and a more durable frame. But as we mentioned above, the warranties are not so great on any of the Nautilus treadmills. Even the top of the line model in the series only has a 15 year frame and motor warranty. If you compare that to the lifetime frame and motor warranty on the similarly priced NordicTrack C 1650 for example, you can see how the T618 falls short. If you do choose to buy a Nautilus, definitely add the additional coverage if it is available to protect yourself down the road. Despite weathering some difficulties years back, when the Vancouver, Washington state-based company lost $90 million worldwide, the company has seen some recovery now that the commercial line has been discontinued. While Nautilus treadmills are reasonably priced home machines, they don’t stand out from the competitive pack of manufacturers who place their sole emphasis on building treadmills. If you want the best machine for your money, go with a primary treadmill manufacturer, and don't buy from a company that not only makes treadmills on the side, but just a few years ago was ranked last by specialty fitness dealers who were asked to evaluate the customer service of equipment manufacturers. The strongest treadmill design from this corporation is the TreadClimber® by Bowflex, and not anything that carries a Schwinn or Nautilus badge. Nautilus T614 - replaces the T514 with an enhanced display, NautilusConnect workout tracking and new cushioning system. Nautilus T616 - replaces the T516 with a dual display, incline capability, workout syncing and a generous number of workouts. Nautilus T618 - the newest model with a stronger motor and larger deck, plus tracking ability with a wide array of workouts.